Spring has arrived. Adder wakes from her hibernation, but Toad is nowhere to be found. Fox and Vixen are teaching their fast growing cubs to hunt. Mole’s mate, Mateless arrives with her two young moles. She brings the sad news that Mole died at the end of the winter. 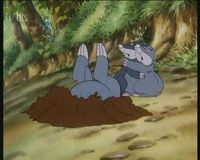 Vixen attempts to break the news to Badger, but he refuses to understand and tells Mateless to send Mole along, as soon as possible. Weasel spots Scarface spying on Vixen’s cubs. Scarface is jealous that they are more advanced than his own cubs. 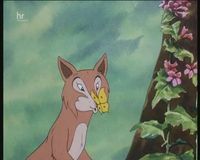 Weasel attracts Vixen’s attention by singing, and warns her that Scarface is spying. Vixen cannot find Scarface anywhere and believes Weasel is making it up. Adder arrives with the news that Toad has left the park in a daze, trying to find Farthing Wood. It is mating season and his homing instinct is pulling him back to his birthplace in Farthing pond. Kestrel and Whistler go to look for him. Down by the pond, a female toad is captured by a human boy and put in a jar. The boy then catches Toad in another jar. Owl catches Scarface spying on the cubs again, and sends him packing. 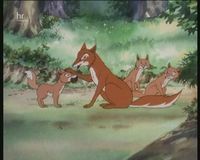 Fox is about to go hunting, and Owl offers to help Vixen keep an eye on the cubs. Scarface returns to his den and berates Lady Blue for giving him inferior cubs. They’ve got your lily-livered blood! Lady Blue goes to see for herself. Meanwhile, Whistler and Kestrel find Toad and the female toad, and rescue them. They bring Toad back to Fox’s earth, but cannot get the jar open. They will have to take him to the warden. Lady Blue spies on the cubs, but is confronted by Vixen and Bold, who growls at her. You’ll have trouble with that one, warns Lady Blue before she runs off. 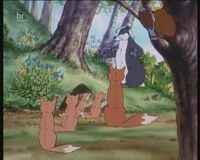 At the warden’s cottage, the warden releases Toad from his captivity, but Fox and Hare wonder how they will keep Toad from leaving the park. Back at Fox’s earth, the female toad, Paddock arrives and Toad is besotted. As the two toads hop down for a swim in the pond, there is no danger of Toad leaving the park now!